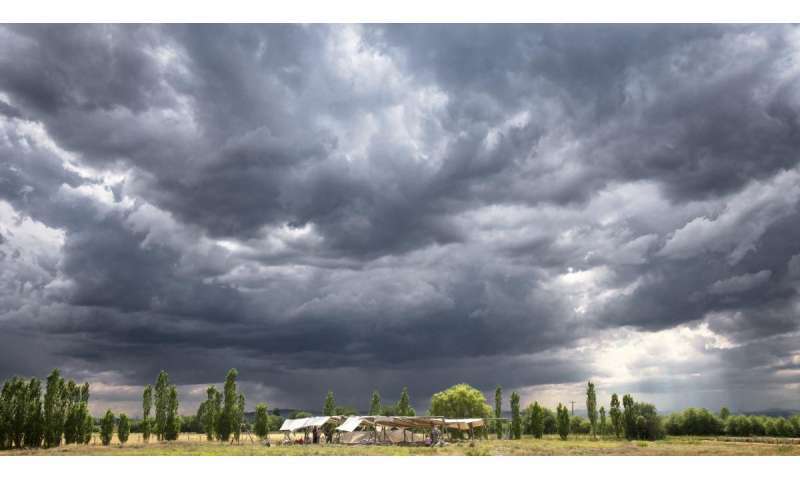 An international team led by researchers from the Max Planck Institute for the Science of Human History, the Freie Universität Berlin and the University of York has uncovered details about the diet of early farmers in the central Anatolian settlement of Çatalhöyük. By analyzing proteins from residues in ancient pots and jars excavated from the site, the researchers found evidence of foods that were eaten there. Although previous studies have looked at pot residues from the site, this was the first to use proteins, which can be used to identify plants and animals more specifically. Using this new approach, the team determined that vessels from this early farming site in central Anatolia, in what is now Turkey, contained cereals, legumes, dairy products and meat. In some cases, the researchers could narrow down food items to specific species. Çatalhöyük was a large settlement inhabited from about 7100 BC to 5600 BC by early farmers, and is located in what is now central Turkey. The site showcases a fascinating layout in which houses were built directly next to each other in every direction, and stands out for its excellent preservation of finds. After over 25 years of excavation and analysis, it is considered one of the best-researched early farming sites in the Old World. For this study, the researchers analyzed vessel sherds from the West Mound of Çatalhöyük, dating to a narrow timeframe of 5900-5800 BC, toward the end of the site's occupation. The vessel shards came from open bowls and jars, as shown by reconstruction, and had calcified residues on the inner surfaces. In this region today, limescale residue on the inside of cooking pots is very common. The researchers used state-of-the-art protein analyses on samples taken from the ceramics, including the residue deposits, to determine what the vessels held. Examples of calcified deposits from modern and ancient vessels at Çatalhöyük. a) Example of extensive limescale build-up on a modern tea water pot used near Çatalhöyük. b) A close-up of limescale deposits on an ancient sample. c) A relatively intact vessel (not analyzed in this study) demonstrating bowl shape. d) A selection of 4 sherds analyzed in this study showing calcifications adhering to the inside surface of ceramic sherds. Credit: Ingmar Franz; Hendy et al. 2018. Ancient proteins from ceramic vessels at Çatalhöyük West reveal the hidden cuisine of early farmers. Nature Communications, DOI: 10.1038/s41467-018-06335-6. The analysis revealed that the vessels contained grains, legumes, meat and dairy products. The dairy products were shown to have come mostly from sheep and goats, and also from bovines. While bones from these animals are found across the site and earlier lipid analyses have identified milk fats in vessels, this is the first time researchers have identified which animals were actually being used for their milk. In line with the plant remains found, the cereals included barley and wheat, and the legumes included peas and vetches. The non-dairy animal products, which might have included meat and blood, came primarily from goats and sheep, and in some cases, from bovines and deer. Interestingly, many of the pots contain evidence of multiple food types in a single vessel, suggesting that the residents mixed foods in their cuisine, potentially as porridges or soups, or that some vessels were used sequentially for different food items, or both. Summary of dietary-derived protein identifications. The left graph summarizes proteins extracted from the sherd's interior wall and the right graph summarizes proteins extracted from calcified deposits on the inner wall. Filled icons represent protein assignments to the genus or species level, while transparent icons represent identifications to higher taxonomies (subfamily, family). In samples CW20 and CW27, blood protein was identified to the taxonomic level of ruminant animals, which includes sheep and goats. In sample CW24, milk protein could be assigned to either bovine or sheep families. Credit: Jessica Hendy; Hendy et al. 2018. Ancient proteins from ceramic vessels at Çatalhöyük West reveal the hidden cuisine of early farmers. Nature Communications, DOI: 10.1038/s41467-018-06335-6. However, one particular vessel, a jar, only had evidence for dairy products in the form of proteins found in the whey portion of milk. 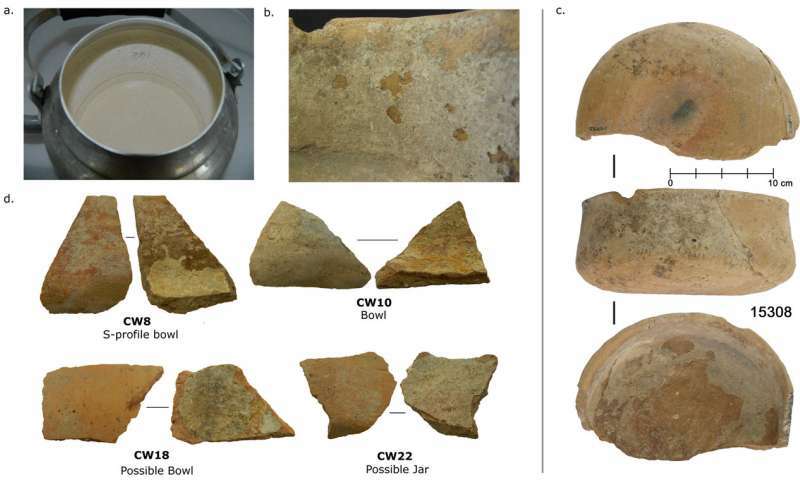 "This is particularly interesting because it suggests that the residents may have been using dairy production methods that separated fresh milk into curds and whey. It also suggests that they had a special vessel for holding the whey afterward, meaning that they used the whey for additional purposes after the curd was separated," says lead author Jessica Hendy of the Max Planck Institute for the Science of Human History. These results show that dairy farming has been ongoing in this area since at least the sixth millennium BC, and that people used the milk of multiple species including cows, sheep and goats. However, the researchers emphasize that based on the archaeological record, an even greater variety of foods, especially plant foods, was likely eaten at Çatalhöyük. These were either not contained in the vessels they studied, or are not present in the databases they use to identify proteins. The "shotgun" proteomic approaches used by the researchers are heavily dependent on reference sequence databases, and many plant species are not represented or have limited representation. "For example, there are only six protein sequences for vetch in the databases. For wheat, there are almost 145,000," explains Hendy. "An important aspect of future work will need to be expanding these databases with more reference sequences." Other molecular techniques applied to ancient pottery can reveal broad classes of food such as evidence of dairy or animal fat, but an analysis of proteins allows a much more detailed picture of past cuisine. 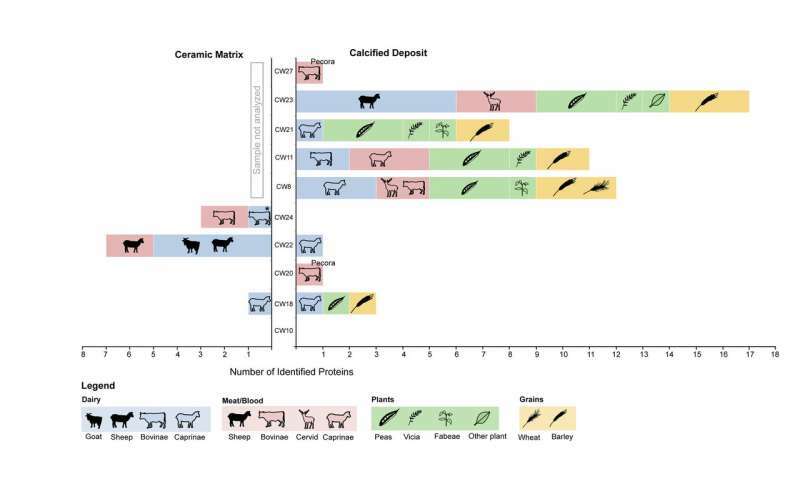 The results of this study show the power of protein analyses, which can identify foodstuffs in situ down to the species level in samples as old as 8000 years. In particular, the residues on the insides of the ceramics were exceptionally well-preserved and contained a wealth of information. The removal of these residues is a common practice among archaeologists as part of the preservation and cleaning process. "These results highlight how valuable these deposits can be, and we encourage colleagues to retain them during post-excavation processing and cleaning," states Eva Rosenstock of the Freie Universität Berlin and the senior author of the study.